I've been dragging my feet on this post for weeks, writing and rewriting...wondering how much is too much to say, how little is too little. Life isn't going as I'd planned or hoped. I am heartbroken. Again. Doesn't that seem to be a reoccurring theme for me? But, I'm dealing with it as best I can. Trying my hardest to heal myself and to be a better, stronger person. Keeping some hope--what little there might be--alive. For now. Because I have to. I have to belief in love and happiness. Besides, cake always makes it a little better, right? 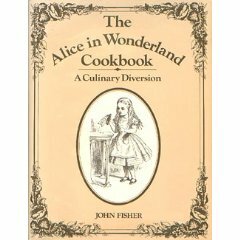 I was looking through a couple of boxes of old cookbooks recently and found a copy of the 1976 British book The Alice in Wonderland Cookbook by John Fisher. Fisher’s book features illustrations and excerpts from Lewis Carroll’s Alice’s Adventures in Wonderland & Through the Looking Glass. Recipes are inspired by each of the Alice passages. Dishes include “Drink Me” Soup & “Eat Me” Cakes, Ambidextrous Mushrooms, Not “Too Much Pepper” Soup, Mock Turtle Soup, Bread-and-Butter-Fly Pudding, and–of course–The Jam Tarts of the Queen of Hearts.